Jedi Knights, Sith Lords, Stormtroopers, X-Wings, Star Destroyers, AT-AT Walkers, droids, Wookiees, Rebel heroes, and more! Imagine big Star Wars adventures at a small scale with Star Wars Micro Force! Star Wars Micro Force figures are expressive, small-scale figures from the Star Wars universe! 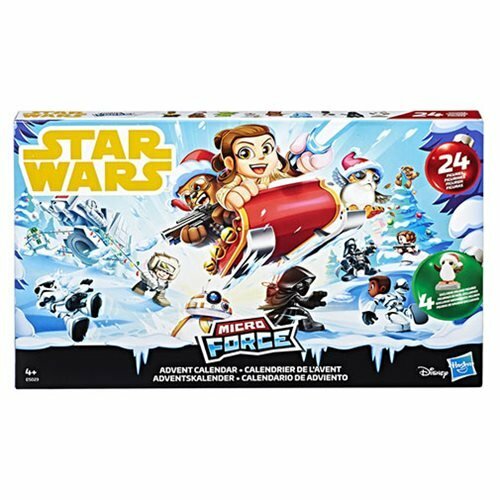 Kids can start or add to their Micro Force collection with the Star Wars Micro Force Advent Calendar, including 24 figures and 7 exclusive stickers from a galaxy far, far away! Look for the holiday-themed figures and translucent figures! Calendar includes 24 openable windows so that for each day of the countdown, kids can discover 1 unique Micro Force figure. Package also folds down to reveal a Star Wars backdrop, so kids can apply stickers and play with figures on a Star Wars-inspired scene! Includes 24 figures and 7 stickers.